Do you ever struggle with the balance between business and your life? As a business owner and live steamer who is focused on building an audience, we know it can be tough! 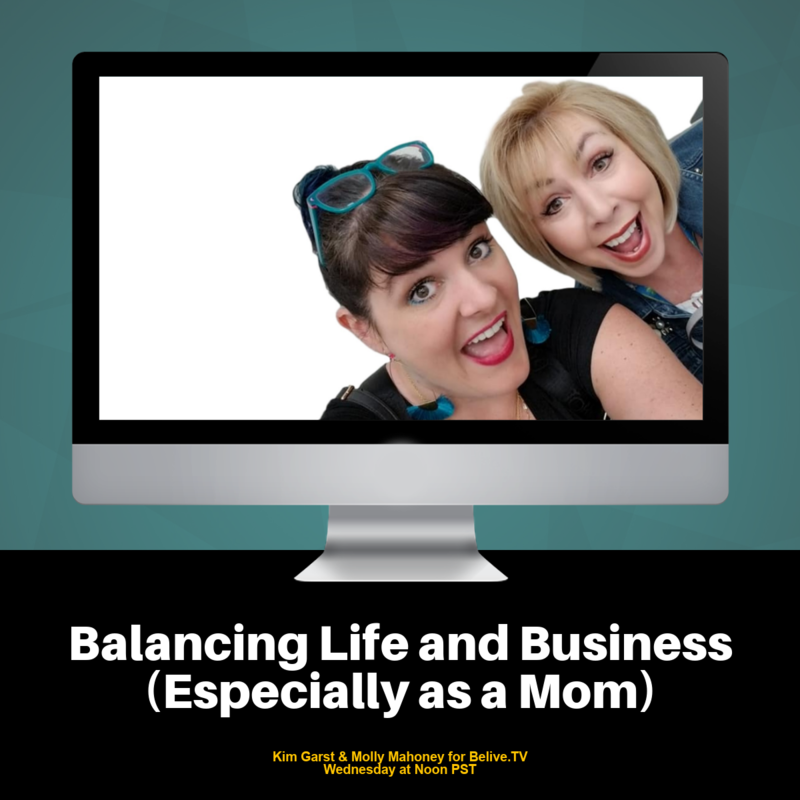 Recently, I had a chat with Social Media Powerhouse Kim Garst about the balance between Building a Business and Raising a Family. Whether you have a family, fur babies, or just want more life/work balance, this is going to be a conversation you don't want to miss. In case you've been living under a rock and don't know Kim, here's a little more about her magic! A highly sought after marketing strategist. Kim is also internationally recognized as a thought leader in the social media space, just check out her Facebook page Kim Garst! Forbes named her as one of the Top 10 Social Media Power Influencers. She has provided social and digital marketing advice to some of the world’s top brands like Microsoft, IBM, and Mastercard as well and hundreds of influential business leaders on digital and social media business strategies. What she enjoys most is helping ordinary people discover their unique “possibles” so that they can build extraordinary businesses that help them live the life of their dreams. She loves watching her son play ice hockey! The following are the Show Notes from the magical interview I had with Kim. When Kim first started her online business she got on the phone and talked to people. Years ago this was necessary for clients to trust the process, but today it is just as important. Connecting with people as real human beings is the best way to grow your business. Get out from behind your computer and be a human talking to other humans. It took Kim 5 years to make her first $60.00 online. If you are struggling to make it keep going! Surround yourself with supportive friends and family and keep moving forward. Kim had a supportive husband that cheered her on! She built her first 7 figure business from her dining room table. Find where ever it is in your home that you can set up and have your “space.” Make it your office and make things happen. Is there really any such thing as balance? Kim says it is more a boundary thing than a balance thing. The life of an entrepreneur can get crazy at times. Sure there is the term Work/Life balance… but these have seasons. There are seasons in both of these: the work side and the life side. What you need to do is set boundaries in each of these areas. You really can have it all. What you need to do is set boundaries that work for you and stick to them. Here are some examples of boundaries we discuss. It is on weekend family time, serving your clients and community, and putting on your own oxygen mask first. Kim had a boundary for not missing her son's hockey games on weekends. That was important to her. She did not want to miss any of his games. Even if it meant turning down opportunities. Put a protective fence around those things that are important to you and don't let other things take them out. And remember that you can “jump the fence” from time to time (make an exception) but still maintain that boundary. Truth moment: if you keep jumping the fence, did your commitment to that boundary really mean anything in the first place? When you achieve a level of success in your business you will find people in your community are constantly asking you if you can help them. Your heart and desire is to help and serve them. This is great but you need to set boundaries and expectations with how much you can serve. You can't always be available for everyone. You will have no life. Truth Moment: If you don't set boundaries and expectations your clients and community will pull you in all directions. Where do you need to set new boundaries or re-commit to old ones? Communicate your boundaries via email, messenger bots, FB Cover photo, Pinned posts etc. What is something you can prioritize today in your family or in your life that will be that fence, that boundary that you can commit to? The point is to make sure the thing you are known for, is the thing you are doing well yourself. When you have a paying client you are hired to do your thing and you do it. But the challenge is for your own business we often times don't feel obligated to do our thing for ourselves. So make sure you showcase your own work for your own business. Make sense? Phrased another way: take yourself seriously so other's can too! Every time you get on an airplane you hear them say to put your own oxygen mask on first. Do this with your own business. Watch the live video for Balancing Life and Your Business: It is Possible! !